Gul’dan: The chain of events set in motion when Garrosh escaped to Draenor has continued, unbroken for all its twists and turns, leading to this very moment. Thwarted in Draenor, Gul’dan now stands on the precipice of achieving ultimate victory on behalf of his Legion masters. 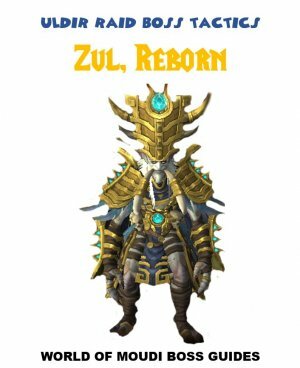 Standing atop the Nighthold, as the vortex of fel energy swirls in the skies overhead, the outcast orc warlock awaits his destiny. Bottom side of the platform. Stand spread from each other. Move to the upper side of the platform and stay spread. Tank the boss in the upper center. Stand close to center and stay spread. Move to the bottom side of the platform. Tank boss on bottom left edge side. Stand spread on bottom right edge side. 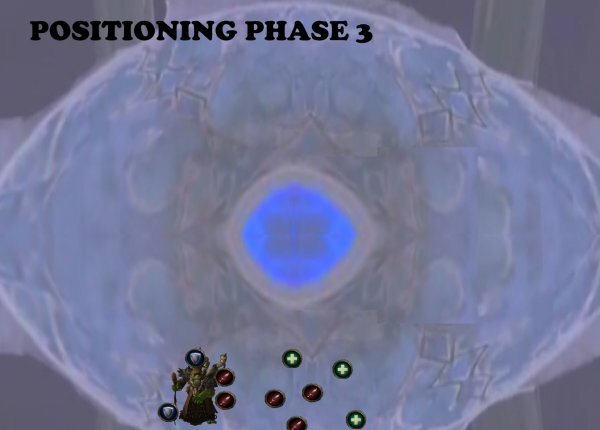 In phase 1 and phase 2, players gain power from the Eye of Aman´thul (Essence of Aman´thul). 30% increased casting, movement, attack speed and Periodic Effects. Place a protective dome that absorbs 50% fire damage taken shared amongst allies within 10 yards. Protective barrier that absorbs all damage taken for 6 sec. You start phase 1 by attacking the boss that is positioned in the center of the platform. When boss summons adds (Hand of Gul´dan), you cannot attack him (Immune) until the adds are dead. Boss will still cast his abilities while the raid is attacking the adds. Shoots a big fel orb at a targeted players location. Does deadly fire damage which decreases the further away players are from the impact. Run far away from the impact. The further you are from impact, the less damage you take. Boss turns to a direction and starts casting a channel of Fel energy. The cast takes 2 seconds before he shoots. Players within the fel energy suffers Fire damage every 0.5 sec. Always keep an eye on boss to see what direction he is facing. Move away from the fel energy (you have 2 seconds). Shoots a meteor at a random position that does deadly damage to anyone within 10 yards of the impact. 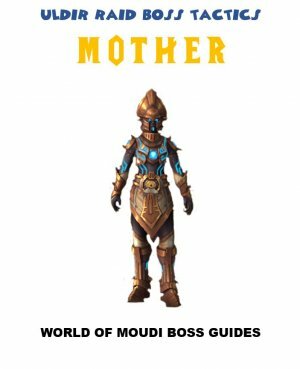 Each meteor consists of 1 out 3 different adds and boss will cast this 3 times in phase 1. Each meteor (with an add) comes every 14 seconds. Does overkill fire damage on tank. A Fel sword from the ground to impale targets. Does high fire damage and stuns players. Summons several eyes that turns and shoots a beam on a target location. Does Shadow damage to any player hit by the beam. Drains health from a random player every second for 21 seconds. The dmg on the player also heals the add. The add blasts tank with Shadow dmg. The add teleports to another location. Drops a cage at tanks location that pulls players to it and does dmg shadow damage every second for 6 seconds. If a player is cought near the cage, they get a stacking debuff that increases dmg taken by 100% and does Shadow damage every 3 second for 30 sec. Shoots out a Shadow volley on random direction that explodes on impact. - Tank the Fel Lord on the right side of the platform. - Use the extra ability Resonant Barrier when the add does Shatter Essence. 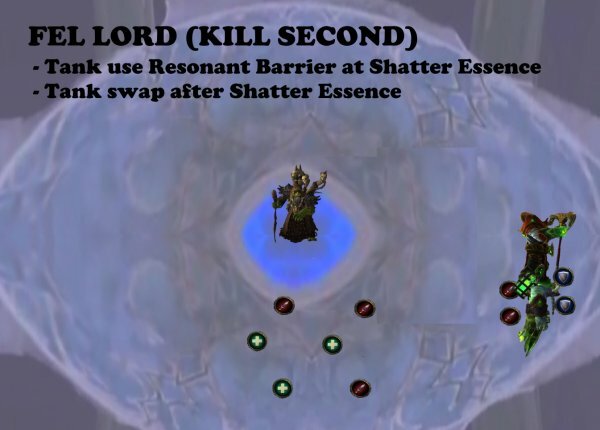 - Tank swap after every Shatter Essence since it has a 3 min cooldown. Start dps on Fel Lord until Inquisitor add spawns. Kill the Fel Lords AFTER Inquisitor is dead. Stand spread on the bottom right side of the platform. Move away from the Obelisk (sword that shoots up from the ground). This add is non-tankable and teleports periodically. Continue tanking Fel Lord. All dps change to this add and kill it before any other add. 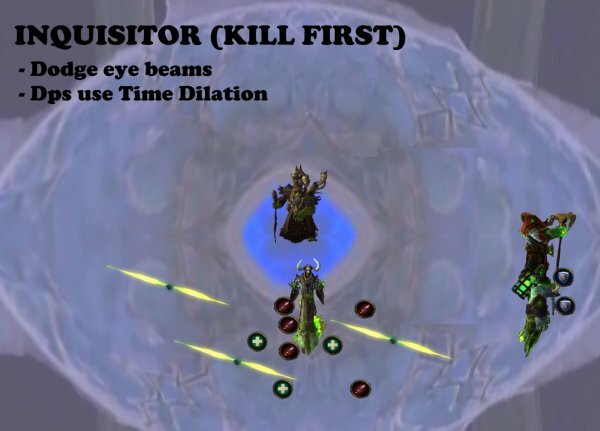 Use the extra ability Time Dilation when Inquisitor spawns. Move away from the eye beams. Use dps cooldowns to kill this add fast. Use defensive/Immune abilities if you are targeted by with drain. Healers use the extra ability Scattering Field on player that is drained. 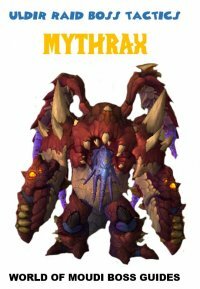 - Off tank picks up this add and positions it to where Fel Lord is. - Move upwards alongside the platform when the trapper does Soul Vortex (puts a cage on your location). - Main tank moves with the Fel Lord downwards alongside the platform when Trapper does Soul Vortex. Kill Trapper AFTER inquisitor and Fel Lord are dead. Move away from the Shadow Volleys. 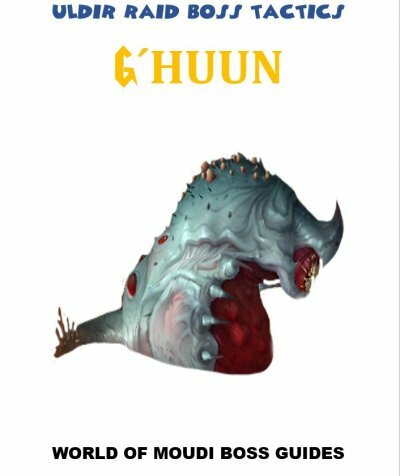 When the adds die, phase 2 will start and Gul´dan can now be attacked again. He has 5 abilities in this phase. At 85%, 70% and 55% health, these abilities become empowered. 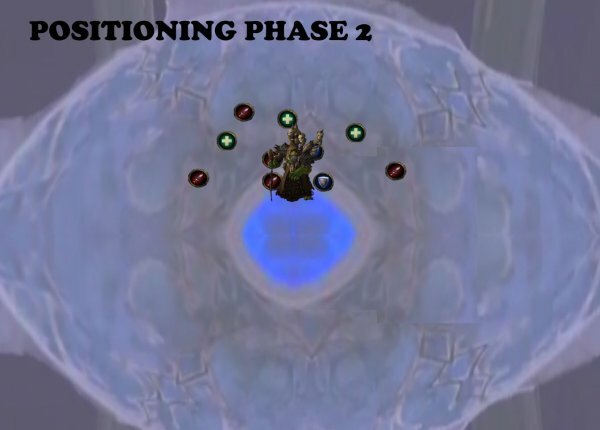 You will still have Essence of Aman´Thul in this phase (extra action bar ability). When adds are dead, stand close to the middle because the boss will do a knockback on all players, that might kick you out of the platform. Boss targets several players (based on number of players in the raid, 15 players -> 3 players targeted). Targets several random players and connects them to the position they stand. Does fire damage every 0.5 sec and snares the player by 50%. 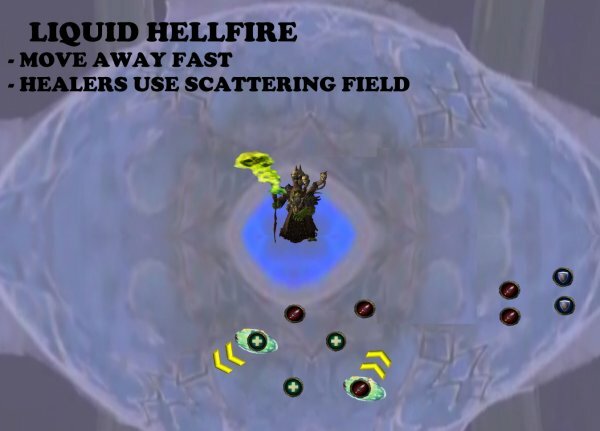 When the bind is broken by running away from that position, it explodes for overkill fire damage to the player and other players targets within 5 yards of the bound target divided evenly amongst targets hit. Targets a random player and binds it to a location after knocking them back. Does fire damage every 0.5 sec and snares the player by 70%. When the bind is broken it explodes for overkill fire damage to targets within 5 yards of the bound target divided evenly amongst targets hit. Stand spread in a half circle around boss. Players that are targeted will have a circle around them. When the player moves from its chain position, the circle will be on the player. Players that soaks the damage need to follow the targeted player and stand within the circle. Every player should help and soak the damage. Beware that tanks can also get this debuff. Side note: If you have immune spells like Divine Shield, Ice Block etc, you can use that. Boss summons several Eye beams that targets a random player and channels shadow energy on that player and also shadow damage to players within 8 yards of that player, every 1 sec. The damage increases by 3% every cast. The eyes also casts a duplicate and moves to a new location. The energy is fire instead of shadow. The eye follows their highest threat target. Take the threat from the eyes when they are empowered. Beware if you are the target by an eye, and don’t run close to other players when nuking the eyes down. The orb also leaves a fire pool on the ground for 3 minutes. Standing on it does fire damage every second. Make sure that you are positioned proper in order to control the fire pools on the ground. Tanks on left side of the center of the platform, face the boss to the center. Melee on the side of the boss. Ranged on the side of the boss, spread out. When there are to many fire pools, entire raid moves to the right, closer to middle. 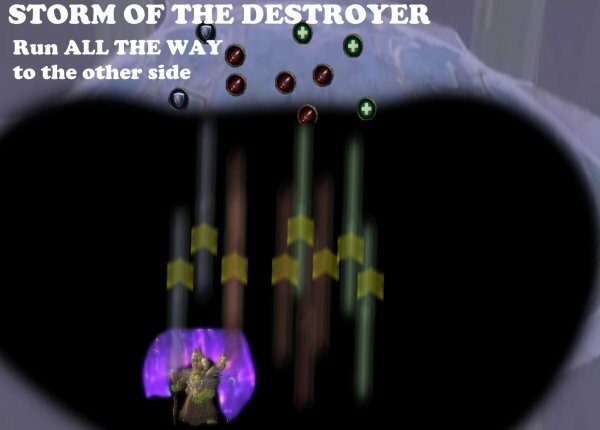 After passing middle area, turn the boss so he faces middle again. When a player stands within 2 yards of the main tank, he will cast Fel Scythe. 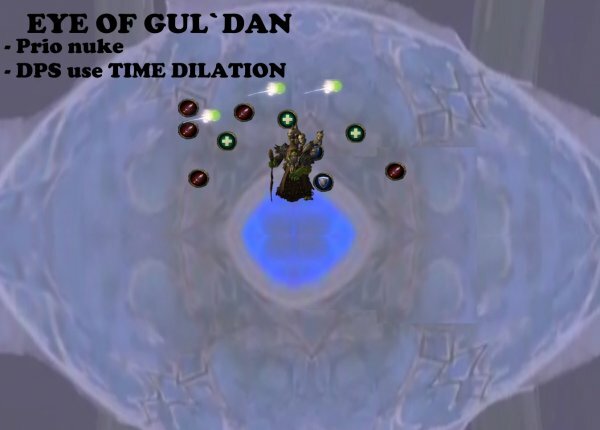 When Gul´dan reaches full energy. Gul´dan has an energy bar that ticks 40 times (40 points) until reaching full energy. Fel Scythe cleaves the tank for very high fire damage divided on players within 2 yards. Fel Scythe also consumes all Gul´dans energy in which each energy point that was consumed, increases his damage by 5%. Fel Scythe also grants Gul´dan an ability called Fury of the Fel. Fury of the Fel gives Gul´dan increased attack speed by 15% for 10 sec and stacks. 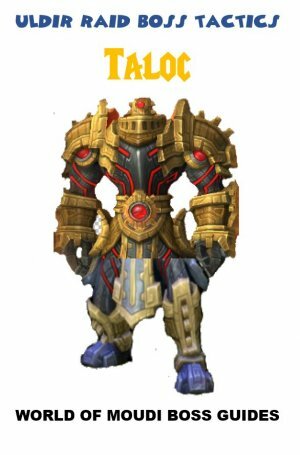 No one stands near main tank (except when main tank has Bonds of fel). Offtank stands on the side/behind boss. Tank swap when boss energy bar is around 40%. Tank swap after you stack on main tank. After tank swap, the other tank moves to the side/behind boss. 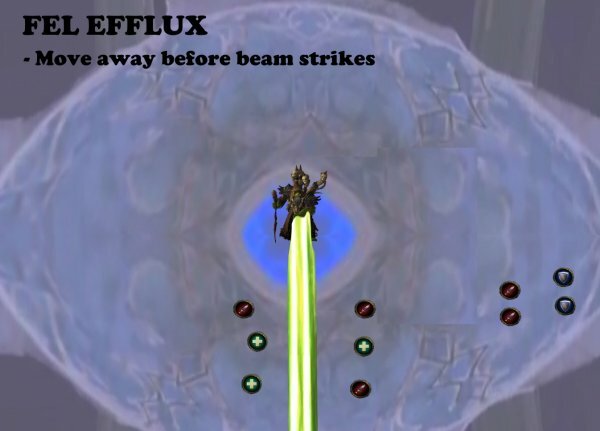 In this way you control this ability so that Fury of the Fel doesn’t stack more than once and that the increased damage from boss energy bar doesn’t reach to high. 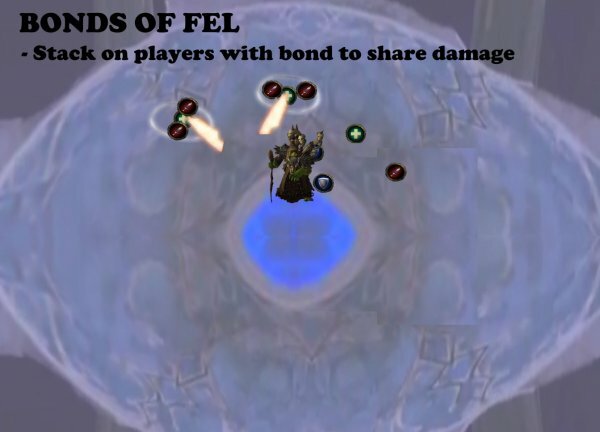 - When main tank has Bonds of Fel. - When off tank moves to main tank before tank swap. Summons a meteor that does very high shadow damage on impact to anyone within 10 yards. An add (Dreadlord) comes out from each meteor. Causes a wave of explosions in front of them that does high shadow damage and putting a player to sleep for 6 sec. If Carrion wave is interrupted, the add increases all damage by 20% and attack speed by 15%, which also stacks every time it is interrupted. 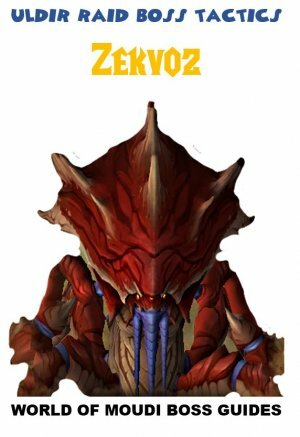 Tank the Dreadloard on top of boss and phase him to the side so that offtank is not close to main tank. When Gul´dan reaches 40% health, phase 3 starts. Boss teleports to the middle again and gets empowered. Players no longer have extra power buffs/abilities. 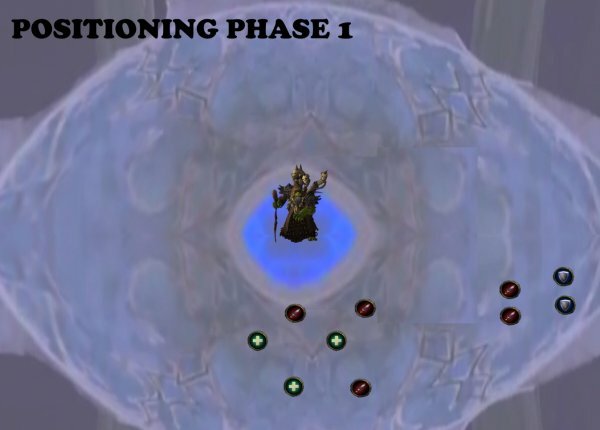 Boss runs to the middle and starts summoning a Well of Souls in the center, for 7 seconds in the beginning of phase 3. Standing in the well does shadow dmg every second and causes enemies to ignore you. 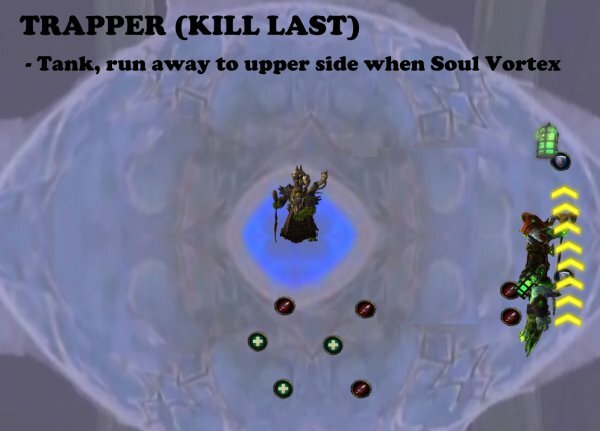 The Well collects soul fragments through boss abilities during phase 3 (Soul Siphon). Based on the amount of soul fragments into the well, the boss will unleash damage to the raid Black Harvest). But, players can take back soul fragments from the well by going in and out from it but entering the well does damage (Soul Corrosion). Boss targets random players with Soul Siphon and a soul fragment from that player is sent to the well. This does shadow damage and applies a 30 sec debuff that absorbs incoming heals. When a player enters the well for 3 seconds, a soul fragment from the well will be returned out to the player. When a player enters the well, it will do debuff that does shadow damage every second for 1 min, and the debuff stacks. Boss does high shadow damage every 2 seconds to every player. 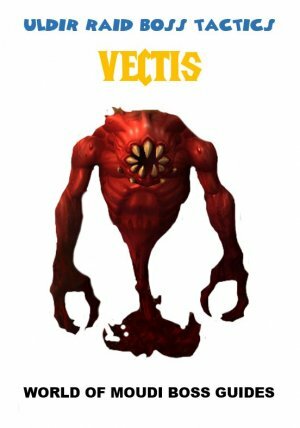 Each Harvest soul fragment in the soul well does extra shadow damage over 4 seconds to every player. 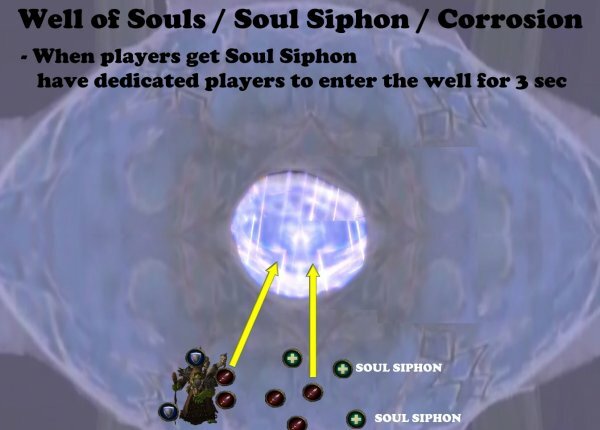 Whenever players are targeted with Soul Siphon, the same number of players should enter the well in order to return the soul fragments. Enter the well for 3 seconds before exiting the well. 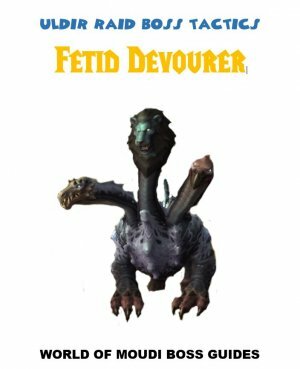 Have dedicated players entering the well and remember that you get a debuff for 1 min, so have different players entering. It will most likely lead to that some players will have to go twice. Dps are preferred to enter the well. All stack on boss for AoE healing. 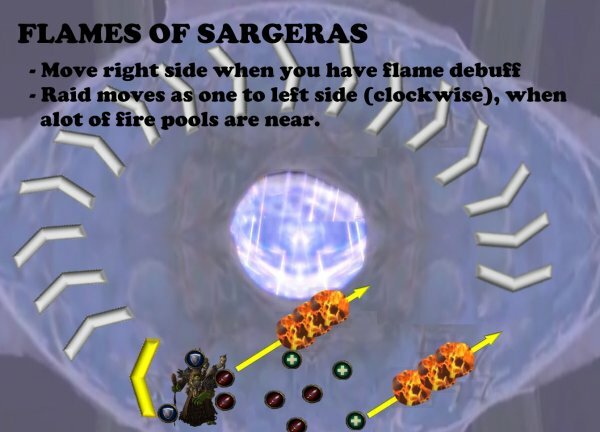 After 3 seconds, those players will burn for 3 sec and each second does a fire explosion damage to them and more to other players within 8 yards. When 3 seconds have passed, they explode again and leave several fire pools on the ground. Move left to have more empty space to fight. Move right to drop of fire pools. Tank boss on the bottom right edge of the platform. Move left (clockwise) when more space is needed from fire pools. When getting a debuff, run to the right center side to drop of the fire pools. Spread out in the bottom center of the platform on the left side of boss. When getting a debuff, run to the right side to drop of the fire pools. Boss summons several Eyes that targets a random player and channels shadow energy on that player and also shadow damage to players within 8 yards of that player, every 1 sec. Does a storm on a location that increases 4 times and does shadow damage. First: high dmg within 10 yards. Second: very high damage to players within 20 yards. Third: very high damage to players within 30 yards. Fourth: Deadly damage to players within 60 yards. Make sure you are tanking the boss on the outer side of the platform, in this way, there will be space to run when you run to the opposite side. Run away fast to the opposite outer side of the platform. Tank swap when boss has 15 stacks (energy bar is around 40%). Use it at start of Phase 3.